However, India’s markets remain difficult to access at scale for huge investors like Bridgewater. This gives smaller players an opportunity to legally front run and benefit from the structural growth on offer for investors. To understand why he stated that India has the best projected growth, we very briefly summarise Bridgewater’s study here. However, for those that want to read the entire paper click here. Bridgewater’s research into the Formula for Economic Success is built from a top down perspective, based on fundamental cause-effect relationships. According to their big picture analysis, the productivity and indebtedness of a country are the lead indicators that determine economic success. Rather than fitting the data, Ray and his Bridgewater team used a simple logic-weighted index on these two indicators (two thirds for productivity and one-third for indebtedness) for each component. Together these indicators were 86% correlated with predicting a country’s subsequent 10-year growth rates going back 65 years. 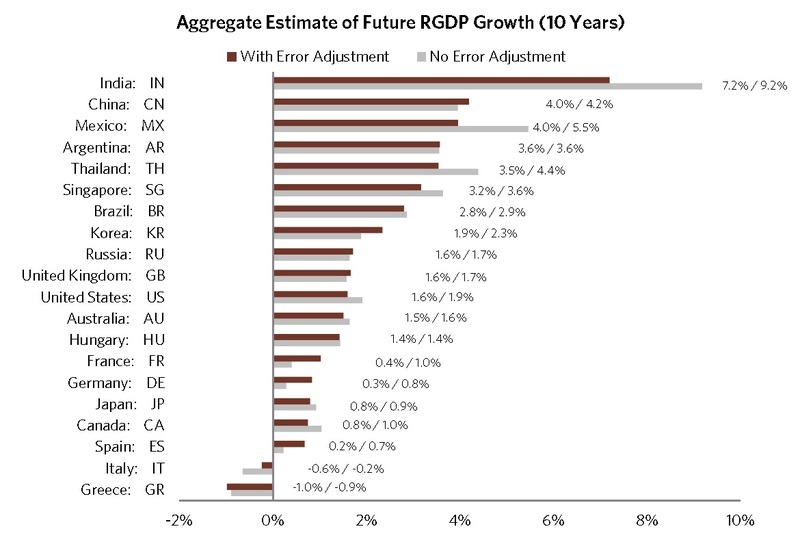 Based on this, Bridgewater’s estimates for real growth for the next 10 years are shown below. Productivity is driven by how cost effectively one can produce, so competitiveness will have a big impact on growth. Specifically, people are the largest cost of production and countries that offer the best value (i.e. productivity adjusted for cost) generate the most demand and hence the highest growth rates. Ray calls this the cost of production arbitrage, and the magnitude of this competitive arbitrage is driven by the cost of a country’s workers relative to how hard they work, their education, and investment levels. This is by far the biggest driver to growth. Culture is another big driver of productivity, as countries that have people who work hard, strive to innovate and allow an efficient market-based economy to thrive will prosper over those that don’t. Indebtedness varies from country to country depending where they stand in the long-term debt cycle. For countries where debt levels are low relative to income levels and are rising, spending generates rising incomes and rising net worth, which raise borrowers’ capacity to borrow, which allows more buying and spending. However, since debt can’t rise faster than money and income forever, there are limits to debt growth. Countries that have low amounts of debt relative to incomes, and debt growth rates that are low in relation to income growth rates, along with supportive monetary policies will grow faster than those that don’t. 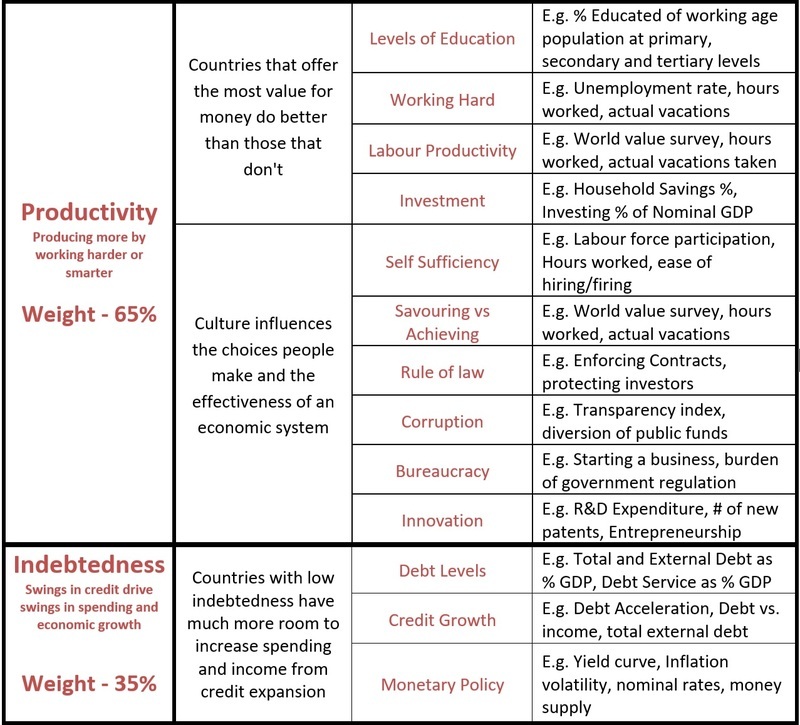 The table below illustrates some of the sub-components and factors used to assess productivity and indebtedness used by Bridgewater. So why did India score so strongly? While countries that operate efficiently will grow at a faster pace than countries that operate inefficiently, the countries that will grow the fastest are those that have big inefficiencies that are disposed of. As an example, in the 1970s and 1980s, China had a well-educated, intelligent labour force that could work cheaply, but faced a closed door policy. Reforms in the late 70’s unleashed China’s potential. According to Bridgewater’s measures, India is best placed to see productivity growth at this point, driven by a very youthful, low cost, hardworking and achievement-oriented labour force. India also is very good in innovation and commercialising innovations relative to its income level. India is investing heavily in research and innovation, and its outputs from innovation, including inventions and earnings, are very high. Finally, relative to its income, whilst India has somewhat high bureaucracy and red tape, it has surprisingly low corruption levels and somewhat strong rule of law. India has the ingredients to grow income per worker around 9% annually over the next decade. It also has sizable potential to boost its growth rate if it can reduce its inefficiencies through reforms, something that Prime Minister Modi is working on. Whilst China scores better than India along most measures of what a country offers, Chinese incomes have grown considerably over the last two decades. India looks to have the most attractively priced educated population in the world with the cost of a quality adjusted worker in India about a 10th that of a worker in the US (Not all that different to what China was 20 years ago). This is particularly significant given India appears just as innovative and commercial as the US when one accounts for its stage of development. Compared to much of the developed world, which has reached its long-term debt peak and is deleveraging, India’s low indebtedness means there is much more room for spending and income growth to come from credit expansion. So how do we front run Ray Dalio? Bridgewater are usually clandestine about their positioning, but Ray has been open about his views on China and India. Bridgewater already run a China fund and when asked about the potential of launching an India fund, he stated “It’s all a function of the liquidity and the accessibility of the market. That’s our issue. When it improves enough, we will be there.” I can understand why Bridgewater will have to wait. Whilst they trade India in their current funds, to run a fund dedicated to India that is meaningful in size for them, India’s financial markets would have to get bigger, particular in the instruments that they predominantly trade in. When he talks about accessibility, this is due to the fact that foreign investors need a licence to invest in Indian stocks and derivatives. Although the current size is a problem for Bridgewater, it certainly isn’t for us, as India’s share market is bigger than Australia’s with average turnover of US$5-6bn/day and a market cap of ~US$2.2trillion. There is no coincidence that India and China are forecasted to be the top two fastest growing economies and why Bridgewater are either looking or already there. Their growth is structural and not going away anytime soon. By investing now, you can not only front run Ray Dalio and Bridgewater, but also indices and global investors that will no doubt increase their allocation over the coming years.